An easy 7 mile circular trail to Hameldon around many of the historic highlights of the Huncoat area. Click here to view and print out the trail guide leaflet 2012 edition. A 3 mile gentle walk around the centre of Huncoat looking at aspects of its long history. Click here to view and print out the trail guide leaflet 2015 edition. 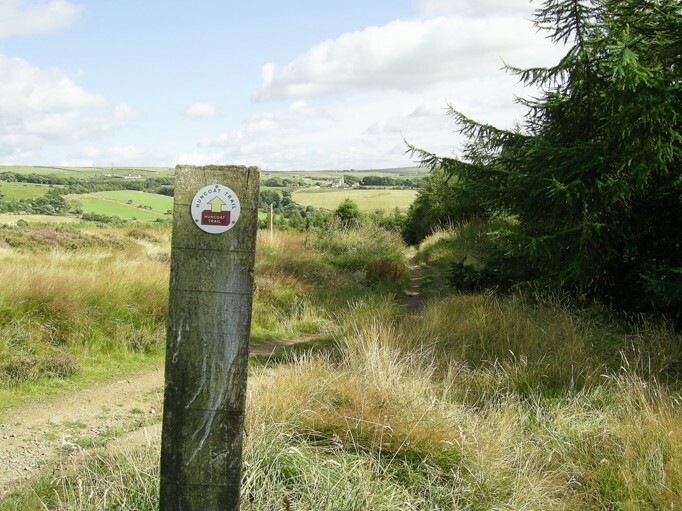 The Huncoat Trail is a 9 mile circular walk roughly following the old parish boundaries of the historic village taking in the best of the local countryside, landscapes and viewpoints. It is not a history or heritage trail as such but does include and draw attention to things like the stocks, datestones, industrial relics, old byways and examples of architecture. 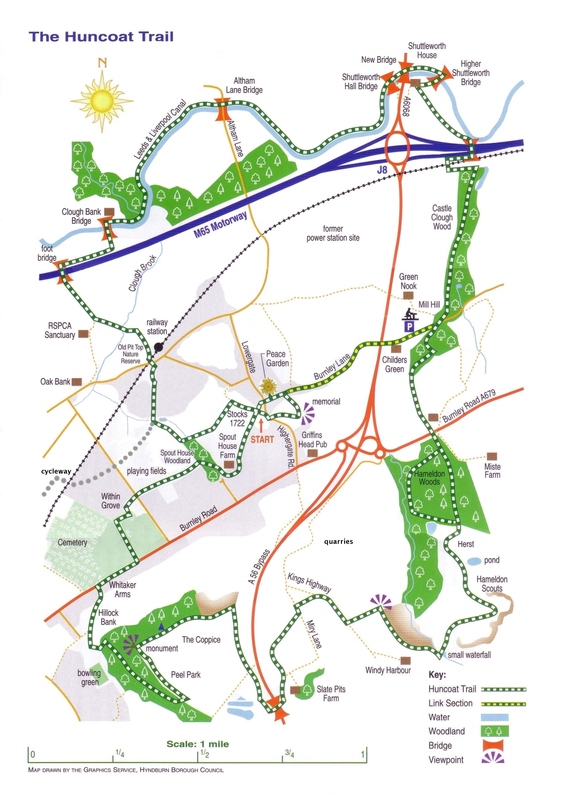 The route includes Spout House Clough, Clough Brook, the Leeds and Liverpool canal towpath, Hapton Castle Clough, Hameldon Woods, Hameldon Scouts, the Kings Highway, the Coppice, Peel Park, Hillock Vale and the original village centre of Towngate. The Trail begins by the village stocks in Highergate Road but can be split into two separate walks each of 5 miles one being relatively flat and the other more hilly. Officially launched in September 2004 by a party of 56 walkers the Trail was created to foster a good image of the area and improve the amenity value for residents and visitors alike. A guide leaflet incorporating a map and directions to follow the Trail was published in July 2005 and during the Autumn of 2005 the way-marking was completed with distinctive engraved plates. On 9th October 2005 the first anniversary was marked with a 'Day of Walks' when groups of villagers and local rambling clubs started a tradition which has been repeated every Autumn since. The Trail was conceived and devised by local resident Roy Chetham. 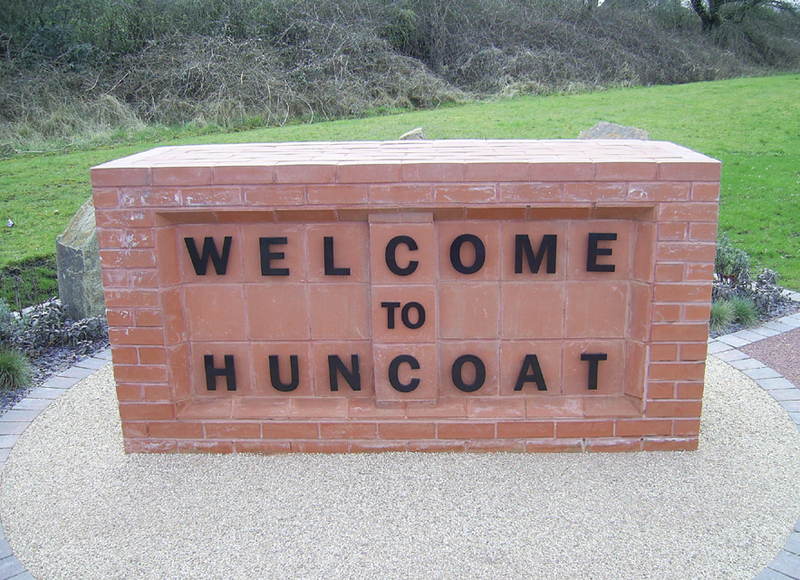 It was promoted by the Huncoat Community Forum in conjunction with the PROSPECTS Foundation and the Huncoat Area Council. Funding was provided jointly by Lancashire County Council Green Partnership Awards (Grants for environmental action in Lancashire) and the Neighbourhood Renewal Community Chest (Hyndburn & Ribble Valley CVS/HyCEN). Cooperation was received from the authorities of Hyndburn Borough Council, Lancashire County Council, Burnley Borough Council and United Utilities. And see Lancashire's beauty unfold. Country walking stirs the circulation and invigorates the body. It inspires the mind, fires the spirit and regenerates the soul. 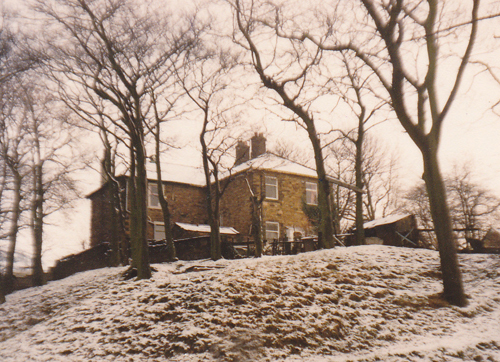 Huncoat is a small village near Accrington situated on the slopes of the Pennine hills below the 1,340 feet high Great Hameldon. The place name was recorded in the 11th Century Domesday Book when Lancashire was still largely covered by peatmoss and woodland. In medieval times Huncoat was the cross-roads for two packhorse trade routes and expanded in the 19th Century with the Industrial Revolution. Between the two world wars the corridor alongside the railway line was heavily industrialised with collieries, coke works and brick yards. However, in recent decades there has been a tendency towards rural regeneration and there are now many green open spaces with striking panoramic views. Huncoat has become a delightful blend of fields, woodlands, residential development and hill scenery. Huncoat is 1 mile east of Accrington on the A679 towards Burnley (near Junction 8 on the M65). Turn into the village at the Griffins Head pub. Roadside only in the village. The nearest public car park is at Mill Hill picnic site in Burnley Lane which is an alternative starting point for walking the Trail. There is a frequent bus service from Accrington town centre and a railway station in the village. The village stocks in Highergate Road. NGR SD777304. Or behind the signal box in Yorkshire Street (more space for parking). NGR SD772307. Or the Mill Hill car park and picnic site near Hapton. NGR SD787308. Use Ordnance Survey Explorer Map 287 "West Pennine Moors" in conjunction with this guide. Look out for the distinctive way-marker plates as a general guide but be aware that they do tend to fade or vanish over time. The Trail is intended to be followed in a clockwise direction. Note that the walk can be split into two separate 5 mile sections. The first half of the Trail is mostly level and can be done separately to the more hilly second half. If starting from the village stocks in Highergate Road do not park a car on the double bend. The stocks date from 1722 and are close to the original centre of the village, which was a crossroads called Towngate. Note the stocks and Trail information plaques within the railed enclosure. Cross the road to the inside of the bend and turn right to go round the front of the house called Bank Terrace. At the iron railings turn left up a curving grassy path into the recreation ground and climb the bank to the War Memorial erected in 1922. From here there is a panoramic view of the surrounding area which includes Hameldon Scouts, The Coppice, Darwen Tower, Great Harwood, the Hodder Valley, the Bowland Fells, Pendle and Boulsworth Hill. From the Memorial bear left and walk down the slope towards a gap in the nearest buildings where a track leads into Burnley Lane. Turn left and cross over before the road end to reach the Peace Garden on the corner with Lowergate. Here, set in the wall is the Barraclough Datestone of 1768 together with an interpretation board. Cross Lowergate Road to return to the stocks passing by Hill House, the oldest surviving building in the area, with a cluster of rustic homesteads behind. At the stocks take the gravel drive by the end of Pipers Row to pass in front of Higher Hill House Farm and straight along the enclosed lane. On the left is an open view over Spout House Woodland and Within Grove. Ignore the first stone gateposts and stile on the left to reach a stile at the end of the lane, here turn left and follow the old hedgerow down the bank. (There is a clearer footpath down the bank on the far side of the next field strip but this is not a public right of way). Towards the bottom the ground is rough and boggy. Pass an overgrown stone stile and bear right by the fence over plank bridges. A stile on the left is an alternative route through the woodland, useful if the normal route is boggy. Otherwise, cross the footbridge and bear right by the fence. Go through the gap into the right hand field and turn towards the brick houses. The next stile is in the opposite diagonal corner. This brings you out on a tarmac path (Greenway cycle route). Turn right and go straight through the Bluebell Way housing estate which occupies the site of the old Huncoat brickworks and Perseverance Mill. (Here in Yorkshire Street is an alternative starting point for the Trail with more parking space)..
Cross over the railway at the signal box and level crossing and turn right through a gateway into the old pit top nature reserve. This was the site of Huncoat Colliery founded in 1885 and closed in 1968. Bear slightly left initially on the main path into woodland which leads to 3 flights of steps winding down into the bottom of the clough and a footbridge. Cross the footbridge and go up the slope opposite passing near to the RSPCA Sanctuary. Bear right across fields aiming for the distant motorway footbridge (the Trail may get diverted here when a new link road is built). Go over the footbridge (constructed with the motorway in 1983) and keep to the right hand side of the field before turning left at a ruined wall leading down to the canal bridge. Cross Clough Bank Bridge and turn right (or to avoid the steep slope turn left and double back underneath it), to walk eastwards along the canal towpath for 1� miles. Along here the views open out over the Calder Valley towards Whalley Nab and Pendle. Pass under Altham Lane bridge (known locally as the Rabbit Run) and the two bridges at Shuttleworth Hall. Leave the canal at Higher Shuttleworth bridge (number 120) turning left and going over the bridge and then along the lane past Shuttleworth House. At the T junction by the farm turn left past the rear of the house and through a gate on the left into fields. Turn slightly right heading for the corner with the canal and motorway bridge. On reaching the canal turn right under the motorway underpass and follow a fenced track up steps beside the railway. The East Lancashire Railway through Huncoat opened in 1848. Turn left over the railway line at crossing point. Turn left in the field and enter woodland. Turn right and follow the marker posts along a high level path above the gorge. Avoid stiles into fields on the right and keep to the main path in the woodland until it comes out onto a tarmac road. If doing only the flat section of the trail turn right along this road and its � mile back to the stocks. (An alternative starting point for the Trail). Cross over the road bearing right through the car park, past the picnic benches and follow the path down to a stream and a footbridge. Over the bridge turn right on the path through the woodland to reach a gate by another footbridge. Here turn left, through a gate and up a steep bank with gorse bushes. Keep near to the gully on the left aiming for the nearest farm buildings that come into sight. On approaching the low wall with a gate keep to the right outside of the wall to avoid chained up dogs in the yard. Pass between poultry sheds and the wall to reach a stile onto the main Burnley road. Cross Burnley Road into the woods opposite. The tracks in this woodland were opened in 2003 and form part of the Forest of Burnley. Follow either of the main tracks climbing steadily within the woodland to come out at the top. Go over the stile and follow the path straight ahead to gain a rutted track running across the slope. Turn right and follow this track which shortly curves left climbing the hill. At a junction by a large rock and just before reaching a pond strike up the steep grassy shoulder to your right which soon presents a rising path skirting the steepest slopes and leading into a gully characterised by stone spoil heaps. Climb up the centre of the gully until level land is reached. At the top of the gulley amid old stone workings turn right along a fairly level old track bed initially running straight between mounds towards the distant farm but then veering left at a small quarry to cross the head of the gorge by a wall end and small waterfall. Cross the wall stile and stream near a small waterfall and turn right along the gorge edge keeping the farm to your left. Cross a fence stile and keep to the rough and precipitous edge of the slope heading for the next stile below a pylon at the far end. Once over this turn left alongside the wall to reach a rough stony road. Turn right down the stony road for 200 yards and just beyond a bend watch carefully for a gap in the wall on the left into the field. Keep left by the wall and at the next farm road (Miry Lane) turn left. Go through the gate and then immediately right over a stone wall stile bearing diagonally left across the field to a stile in a fence. Then, diagonally right to the next stone squeeze stile after which keep to the right hand edge of the field curving round towards the next farm. Turn right down the farm lane keeping left when you approach the main road to cross it by the underpass. This is the Accrington Easterly Bypass which opened in 1985. At far end of the underpass turn immediately right through a gate overlooking three small lodges. Keep close to the fence on the right as it dips down and then up again to a stile in the right-hand corner. This open land is a country park bequeathed to the Borough of Accrington in 1909. Follow the fence line overlooking the dual carriageway on over the summit to the front of the hill from where there is an aerial view of Huncoat. Turn left along the front edge of the hill and when nearing trees keep them on the right to pass the highest point marked by the O.S. trig column (843 feet). Aim for the monument on the end of the hill. The swathe of trees blocking some of the views were all planted in 1972/73. The monument is to the benefactor of the country park William Peel of Knowlmere. 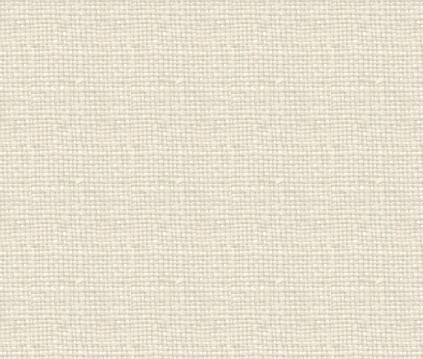 From this point there is an aerial view of Accrington. Turn left keeping above the treeline to follow the main path which gradually descends. At a major cross-paths turn down to the right through the trees. Keep straight on down the main track which gradually descends to the park entrance beyond the bowling green. Go through the gate, across the spare land used as a car park for the bowling green and then bear right along the rough road between allotment pens. When the road swings left keep straight on by the fence past more pens and along a passageway fringing a derelict poultry farm. (The route here may get diverted if planned new houses are built on the site). The passageway turns a left corner and comes out down the side of the Whitakers Arms pub. The present pub buildings date from the time of the turnpike construction in 1838. Cross over Burnley Road and turn right past the main gates of the cemetery (opened in 1864). Before the exit gate out of the cemetery look for the footpath sign through the gap in the wall opposite to Hillock Vale Mill Shop. Take this route through the cemetery, (if you have a dog keep it on a lead). Cross the grass diagonally right to reach the driveway leading down to a cross-roads. Turn right and then look for an iron gate on the left leading out of the cemetery through a passage between the houses. At the end of the passage turn right past the front of the shops and cross straight over Bolton Avenue into Oakhurst Avenue (between the Newsagents and the church). When the road bends to the right branch off straight across the top of the playing fields keeping all houses to the right. Continue past the children's play ground across a field and over a stile into woodland. Turn right and follow the main track up through the woodland. Once over a plank bridge turn right to reach the top of the woodland. Seek out the two Baptist Union foundation stones set in the high garden wall covered by creepers just to the right of where you emerge into the lane then turn left to follow the signed passage around the outside of Spout House farm yard. Keep in the walled lane known as Clegg's Lane which gradually rises behind the houses until you come back to Higher Hill House Farm and the end of the Trail at the stocks.